In an attempt to improve our services and empower you with more product knowledge and new mediums of information, we have recently upgraded our website. We have added to our brochure section, providing even more information for you to download. We’ve added an enquiry form that sends your enquiries straight to our sales office and most importantly we’ve added a VIDEO section. This links directly to our YouTube channel and showcases our growing range of instructional videos. 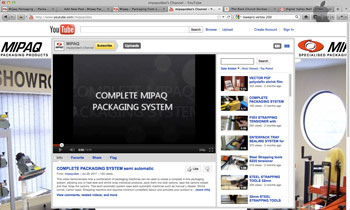 Click the video link or visit our channel at www.youtube.com/mipaqvideo. Now you can get an exact understanding of how some of our most popular machines and equipment work , enabling you to make a more educated decision when choosing the right packaging equipment for a specific application.